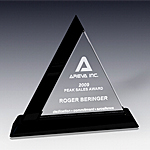 Mountains symbolize acceding the highest peaks of success while overcoming obstacles that lay on the way to the top. 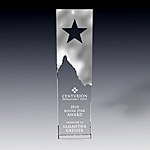 Crystal mountain awards and trophies recognize achievers that made it to the top. 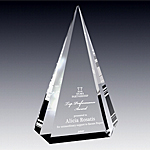 To celebrate top achievers we created a unique collection of crystal awards and trophies that feature mountain peaks. 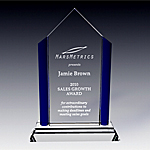 Mountain awards series are perfect for recognizing personal milestones, career advancements, meeting and exceeding professional goals, such as production or sales goals. 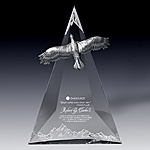 Our most exclusive crystal mountain awards are the Soar High award and the Top of the World award. 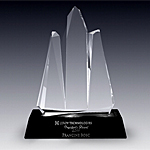 Both awards are from our elite Everest crystal award collection and they feature unique design in conjunction with combination of contrasting materials. 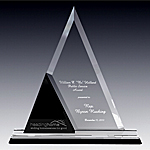 Crystal Apogee award features three peak mountain range produced from clear crystal set a top of black crystal base pedestal. 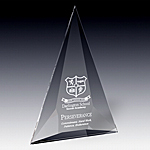 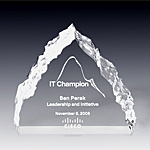 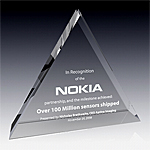 Delano Peak award plaque offers a combination of blue and clear crystal. 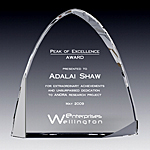 Our crystal Mountain Peak award displays a beautiful ridges on the sides of its slops and has been extremely popular as a corporate recognition gift.